It's always quite convenient for me and the people around here if books are released simultaneously, because we are among the first ones to have a chance to buy it. Considering our time zone here, even the US will have to wait a few hours later to enjoy this privilege. And so with that thought in mind, while everyone else is still waiting, I already happen to know the title of the first book in the new series by Rick Riordan called Magnus Chase and the Gods of Asgard, a projected trilogy just like The Kane Chronicles. So if you don't want to be spoiled and wanted to know it first hand, this is the time for you to stop reading. I just bought a copy of The Heroes of Olympus: The Blood of Olympus. And I am literally shaking, as always. Though the Greek and Roman crew members of the Argo II have made progress in their many quests, they still seem no closer to defeating the earth mother, Gaea. Her giants have risen-all of them-and they're stronger than ever. They must be stopped before the Feast of Spes, when Gaea plans to have two demigods sacrificed in Athens. She needs their blood-the blood of Olympus-in order to wake. Excited as I am, I jumped immediately to the last pages to know the title, just like I did with the previous book. And so to avoid inducing you some heart attack due to a cliff hanging reveal, here is the title of the first book in Magnus Chase and the Gods of Asgard by Rick Riordan. 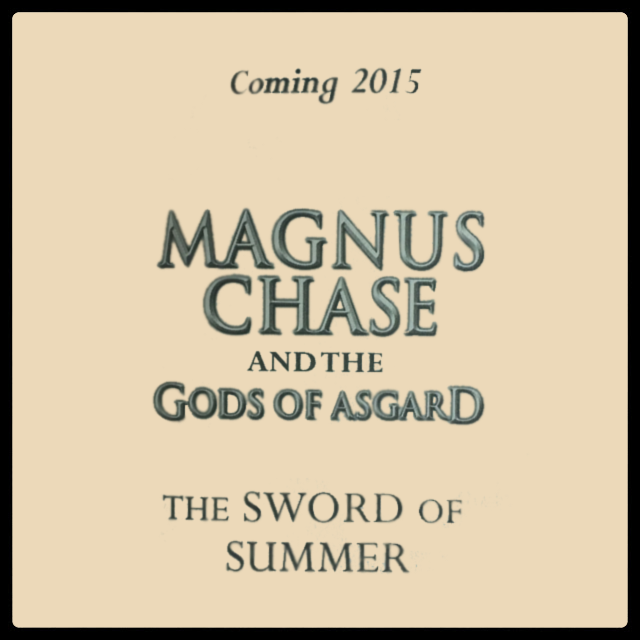 And we already have a synopsis of Magnus Chase and the Gods of Asgard: The Sword of Summer. You read it right. It is called Magnus Chase and the Gods of Asgard: The Sword of Summer. And as usual it is coming around fall season of 2015. That's October 6, 2015, a year from now (according to this Kindle listing in Amazon). Are you excited with Rick Riordan's new series? For now I'll just satisfy my longing with this book by enjoying The Heroes of Olympus: The Blood of Olympus that I am sure Rick Riordan has poured all his antics into it. Signing off for now, until I am done with this beauty.